Waterproof cement-based mortar for protecting and finishing concrete. 12 months from date of manufacture if stored correctly in cool, dry place in original sealed, undamaged package. 1: protection against penetration (cladding); 2: humidity control (cladding); 8: increased resistivity (cladding). 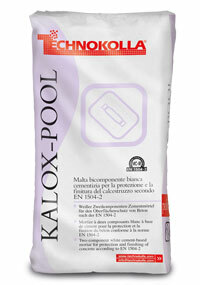 - Visually exposed pigmentable finishing treatment for swimming pools. - Protection treatment for water works such as: pools, tanks, concrete pipes. - Flexible coating for reinforcing concrete surfaces and protecting them against the effects of deicing salt and freezing-thawing cycles, carbon dioxide and water in the liquid state. - Waterproofing surfaces exposed to the weather. Concrete, cement-based plaster, cement-lime mortar, cement-based screeds.